You know what are QR Codes and how to create one. You have probably noticed the scannability of a QR Code despite there being dirt or damage. And you have also seen QR Codes with a logo. Despite there being a damage or an error, the QR Code being used scans perfectly fine. This is because of QR Code error correction feature. QR Codes have error correction capability. This means they can restore the data if the code is dirty or damaged. Hence, a QR Code keeps functioning even when a part of it is removed, damaged or even obscured with a finger. Error correction happens by implementation of Reed-Solomon Code. In a nutshell, it adds backup data to the QR Code mathematically. Raising the level improves error correction capability and also makes the QR Code dense. Certain online QR Code generators such as Scanova allow users to choose the level of error correction while creating a QR Code. Check if your QR Code Generator has this feature. Besides making the QR Code scannable, error correction also creates a room for creativity. It is error correction that allows you to add logo to your QR Codes. By removing some data from QR Code, it introduces an error. Then the logo is added. Hence, one should always choose a higher level of error correction while creating a QR Code with logo. Factors such as operating environment and QR Code size are important determinants of error correction level. High levels of error correction are also recommended as one decides to get a QR Code tattooed. This is because higher the level of error correction, greater the data modules and thus, greater the scannability. Since QR Codes are easy to create, use, and have diverse types, their popularity is soaring everyday. 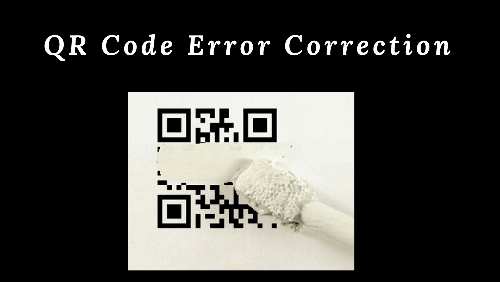 That’s all you need to know about QR Code error correction feature.